It seemed like the weather for pie. 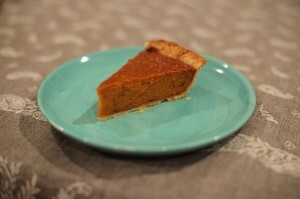 I remembered my mum’s pumpkin pie from when I was little and thought how nice it would be to make a non-vegan version. Mum’s recipe was vegan and was delicious; so how much more delicious with eggs and cream!! The recipe I used was from joy of baking.com and I took the advice of making it more delicious by pressing crushed gingernut biscuits into the unbaked pastry for extra flavour. I think this pie is best cold, though I couldn’t resist eating some warm. It just tastes more eggy while warm. The crust is crisp and the filling is moist and beautifully spiced. As pumpkin pie is not nearly as popular in Australia as the USA it’s rare to come across one in a Sydney cafe or cake shop. So make your own and enjoy! Entries (RSS) and Comments (RSS). 30 queries. 0.224 seconds.